Sometimes the long and winding road leads back home. And a poem posted by a fourth-grader on a bulletin board in a Monitor School classroom can lead to a world premiere play in Portland. That’s the journey E.M. Lewis has been on – and continues to take. Lewis moved back to Monitor three years ago after spending most of the previous decade in Los Angeles… and New York and New Jersey and Kansas and Illinois and Ashland. That can be the life of a playwright as well as other theater artists. A fellowship here. A residency there. Training in New York City. And always writing, always writing. “I knew I wanted to be a writer, but it’s not a thing that comes naturally, believing you can be a writer,” Lewis told Our Town during an interview at her family’s farm, just a short mosey from that fourth-grade classroom where Mrs. Barrum posted her poem. “This is a big play for me,” Lewis said, who has been a steady presence at rehearsals – when not flying to Maryland for work on a world premiere opera that opens Feb. 9. “I hope people will like my story. The adventure lasts five-and-a-half hours, including three intermissions and a dinner break. It’s an extraordinary commitment for a theater company. Artists Repertory is using $110,000 in grant money from the Oregon Community Foundation and the Edgerton Foundation to pay for the extra rehearsals the production requires and to offset the loss of income because fewer performances of Magellanica were practical given that most news plays are in the 90-minute to two-hour range. The play is set in 1986, when scientists first began studying a hole in the ozone layer, a seminal moment in the Earth studies that led to climate change science. USC was next, where she earned her master’s in professional writing. The program took an interdisciplinary approach and Lewis found herself working in fiction and screenwriting. “All of that was fantastic,” she said. “Some of the teachers spent years as working writers,” noting Hubert Selby Jr., who wrote the 1964 novel Last Exit to Brooklyn. One of the screenwriting teachers had been blacklisted during America’s “red” scares. Master’s in hand Lewis stayed at USC in a tech and communications job, with the added benefit of free classes. She started working with Lee Wochner at a “small, scruffy” theater company called Moving Arts. Lewis was an assistant director who also sold tickets and swept the floors. Then she wrote Infinite Black Suitcase. 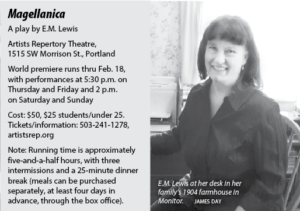 The play, which she refers to as kind of an Oregon version of Thornton Wilder’s classic play Our Town, tells the story of one day in the lives of 15 characters in a rural Oregon town. More plays followed. Heads about the war in Iraq. And Song of Extinction, about the science of life and loss, which got a boost from an L.A. County Arts Commission grant to Moving Arts. Lewis was starting to break out. “I had my day job at USC. It was a perfect fit. I was making a good salary, and at 5 p.m. I could go to the theater. In 2010, the success of Song of Extinction earned her a Hodder Fellowship at Princeton University. One year of “pure writing” with no teaching requirement. Lewis made the Hodder money last for three years while she worked on Magellanica. But writing it took five years. She kept working the play, with readings at the Lark in New York City and PlayFest Santa Barbara, a nine-week residency in Independence, Kansas, at the home of noted 20th Century playwright William Inge, and a 10-day workshop at TimeLine Theater in Chicago. Piecemeal employment at various colleges, including Lewis & Clark in Portland, followed. And the theatrical whirlwind began again. First read. Blocking. Taping out what the set would look like in the rehearsal room. A design retreat at a McMenamins in Portland. Lewis was a constant presence at rehearsals. Script changes. And her mood through all of this? “Nervous, excited, grateful, grateful, grateful. It brings me to tears. You try to be professional, but having this many people working so hard to bring a story to life that I thought up in my head… it is magical to be a playwright. I’m so lucky to be able to do what I do and do what I love. I don’t take it for granted. After Magellanica gets up and running Lewis is off to Maryland for the premiere of her opera, Town Hall, a collaboration with composer Theo Popov. In March she relocates to Edwardsville, Ill., for a teaching stint at Southern Illinois and a workshop of her new play The Great Divide, which is set in Oregon.